The turkey tetrazzini is a unique American pasta based dish that will have you relishing in its taste with a creamy sauce and mushroom based paste for the turkey. It can be made with other meats and seafood as well. It is believed that this recipe was developed in San Francisco and takes its name after the legendary opera singer Luisa Tetrazzini who was a resident of the region during the early 1900s. In some ways the recipe is quite similar to the turkey casserole but with a slight twist of its own. If you’ve got some leftovers from your turkey then you can easily use that meat to produce the tetrazzini recipe. In order to prepare the base for your turkey tetrazzini you will require some noodles, linguini, pasta or spaghetti. You will also need sliced mushrooms, unsalted butter, all purpose flour, cream, milk, chicken broth, dry sherry, cooked peas, freshly grated parmesan, fine fresh bread crumbs, shredded Swiss cheese, coarsely chopped cooked turkey and salt and pepper to taste. You will start off by cooking the pasta of your choice following the instructions on the packet. When ready, drain the liquid and set aside to proceed with the next steps. Preheat your oven to 375 F. Next you need to cook the sliced mushrooms over moderate heat in about three tablespoons of butter. Keep stirring until you find all the liquid to have evaporated. This shouldn’t take more than ten minutes after which set aside the mushrooms. Take a large and heavy saucepan and melt about a quarter cup butter in it. Add the flour and continue to cook the mixture on moderate to low heat for about three minutes while stirring continuously. Following this add milk, broth, cream and sherry to the saucepan gradually. Bring the contents to a simmer and continue to cook over low heat while constantly stirring the contents for another five minutes. Take a large bowl in which you can combine the pasta, mushrooms, sauce, peas and the turkey. Season the contents with salt and pepper to taste. Add 1/3 cup parmesan and continue mixing the contents together. Following this add the Swiss cheese and transfer the contents to a shallow casserole that has been buttered. The next step is to bake the Tetrazzini in your oven. For this you need to place it in the middle rack of your preheated oven. 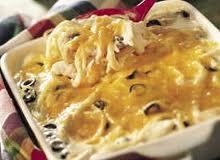 It should take a little over half an hour for your turkey tetrazzini to reach the desired state. If you feel as though your turkey is not well done in this amount of time then continue to bake until you find it to be bubbling at the top and developing a golden shade. The turkey tetrazzini is an easy to make dish and at the same time it is very filling. An excellent choice for a warm family dinner with leftover turkey or alternatively it can make a splendid meal for guests as well.